A normal spine has several front-to-back curves between the neck and the pelvis. 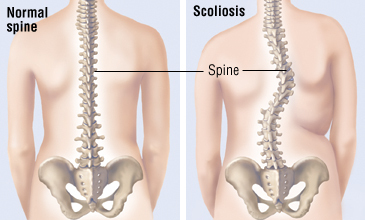 In scoliosis, the spine curves abnormally to the side or twists. Although scoliosis seems to run in some families, most cases appear for unknown reasons in children and adolescents who previously had a straight spine. Scoliosis without a known cause is called idiopathic scoliosis. Girls and boys are affected equally by idiopathic scoliosis, but girls with this condition are more likely to develop curves that get big enough to require treatment.